As one of the original founders of the organization, Jack strives to Live4Evan on a daily basis. Having had Evan as a close friend throughout high school/college, he constantly taught Jack to always enjoy: a day on ski-mountain or at the ocean with good company; time spent traveling; and importance great music. 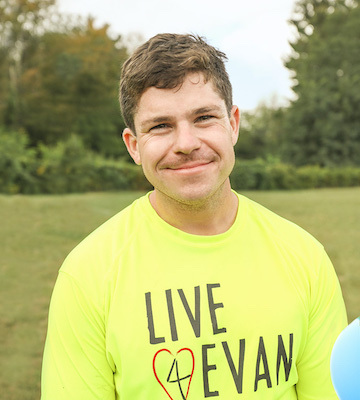 Jack’s passion for the organization is rooted in the determination to continue Evan’s legacy by helping improve the lives of others affected by cardiac disease. The relationships, partnerships, and community support are what keeps Jack motivated to grow the organization in an effort to meet the housing need of cardiac patient-families in Boston. 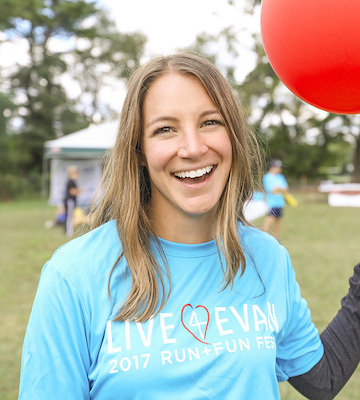 Whitney is one of the original founders of Live4Evan and serves as the head of Marketing and Branding. Her friendship with Evan began in pre-school. Some of her best memories with Evan was when they were studying abroad in Italy and traveled to Rome and Florence together. Whitney’s commitment to Live4Evan stems from Evan’s big heart and contagious love for life, and she strives to keep that alive by giving back to families of children affected by CHD. Whitney has over 8 years of global marketing experience across the consumer packaged goods and technology industries. Whitney currently works at Diageo North America as a Brand Manager for Smirnoff. Prior to that, she worked at EMC Corporation in Massachusetts and San Francisco as a Senior Global Marketing Manager. Whitney graduated from the University of Miami, FL with a BBA in Marketing & Business Management. She lives in NYC and enjoys traveling to new places and discovering all the food + drinks along the way! 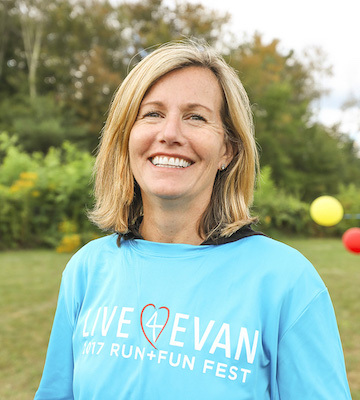 As a co-founder of Live4Evan, Shane aspires to create a lasting legacy for his lifelong friend that allows the spirit of Evan to live on in the lives of those impacted by the organization. 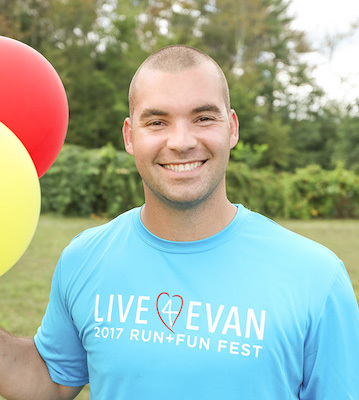 Shane brings a professional background in finance to his duties as Treasurer, where he seeks to maximize the benefits provided by Live4Evan to the families of children with congenital heart disease. 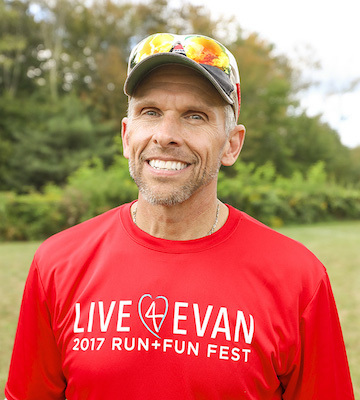 Shane believes that Live4Evan has the passion, knowledge, and community of supporters needed to create a world where children receive cardiac care with family by their side. Rick started Live4Evan because he wanted to start something in the memory of a dear friend while helping others at the same time. Rick graduated from Westfield State in 2012 where he spent the fall 2011 Semester studying abroad in Dublin, Ireland with Jack. Rick can be found on the mountain in the summer and the golf course in the winter. He loves hanging out with friends and loved ones and having the Craic. Michael Girardi is the father of Evan Girardi and currently Vice President of Sales and Marketing for Hamilton Storage. His professional career has been based in the Life Sciences industry leading and managing technology companies in this sector. Michael’s past employment includes President of Titian Software US, President and CEO of REMP USA and Vice President of Customer Support and After Market business for Zymark Corporation. He has been very involved from the outset of Live4Evan and continues to provide guidance and direction to the organization tapping-on his experiences from both his personal and professional lives. Michael holds his MBA from the Carroll School of Management, Boston College, Chestnut Hill, Massachusetts and BS in Industrial Technology from Keene State Keene State College, Keene, New Hampshire. He is a past Chairman of Hopkinton Center Historic District Commission and a current member of the Woodville, MA Rod and Gun Club. Michael lives with his wife Barbara and is the proud father of four children in Hopkinton, Massachusetts. Barbara treasures her role as mother to four children. She deeply values her experiences and relies on them to navigate her way through relationships and life. Barbara believes the most precious gift we can offer others is our presence. She is dedicated to providing temporary housing to families whose loved ones are receiving cardiac care. Barbara and her husband, Michael live in the remarkable town of Hopkinton, MA where Evan and his 3 sisters were raised. David Krueger has spent the past 33 years in the consumer package goods industry, working in various sales & marketing positions on both the manufacturer and agency side of the business. 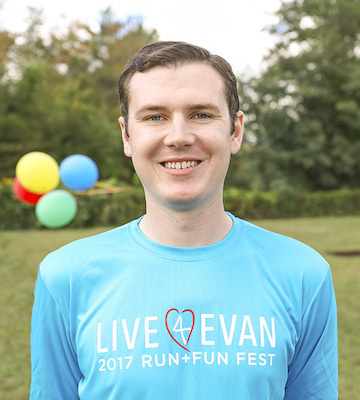 In early 2012 the founders of Live4Evan reached out to David asking him to play a temporary consulting role, and help them get their first annual 5k road race up and in motion. Needless to say, based on his love for the founding group, and their desire to add a “gray hair” to the team… nine months later David joined the Board, and is currently Chairing the Development Committee for L4E. 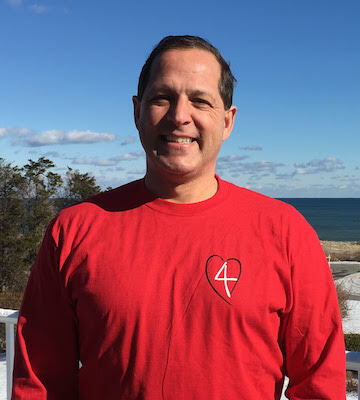 He continues to be energized by the passion and dedication of the Board, and is 100% focused on growth in the Organization and awareness of the L4E mission. David and his wife Betsy reside in Hopkinton, and have two adult daughters living in the area. Shawn Ryan is a CPA and business owner who has worked in accounting and finance for over 30 years. 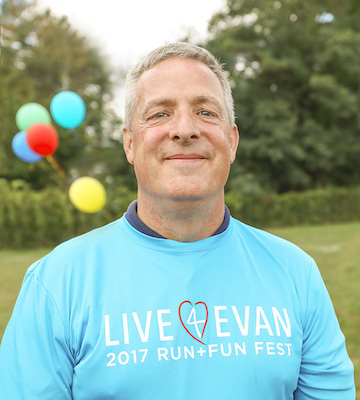 He has a great interest in local philanthropic efforts and was drawn to the Live4Evan organization by the passion of Evan’s friends and classmates (including his daughter) to create a legacy to help families dealing with similar health issues. He has a strong belief that mentoring and supporting the next generation of young people is critical to the continued success of all non-profit groups. Shawn and his wife Lynne reside in Hopkinton and have three adult daughters. 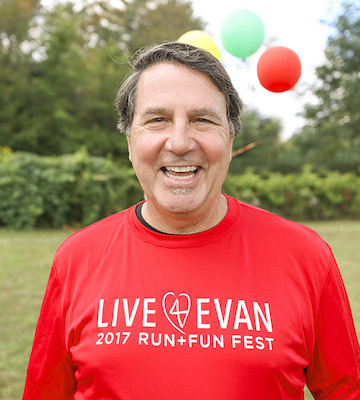 Gary MacDonald joined the board of directors of Live4Evan in 2017. He has more than 25 years of global marketing experience working primarily in the financial services industry. He currently serves as a strategic advisor to organizations ranging from small teams to large-scale global organizations. Gary served as the Senior Managing Director and Global Head of Marketing for State Street Global Advisors, the investment management arm of State Street Corporation, from 2001 to 2017 where he was responsible for all strategic and tactical marketing in the Americas, Europe, Africa and the Middle East and the Asia-Pacific regions. Mr. MacDonald received an AB degree from Bowdoin College. He also serves on the advisory boards of the US Biathlon Foundation, Talent Research Institute and Prattle. Gary has five grown children and lives with his wife Kathleen in Hopkinton, MA.